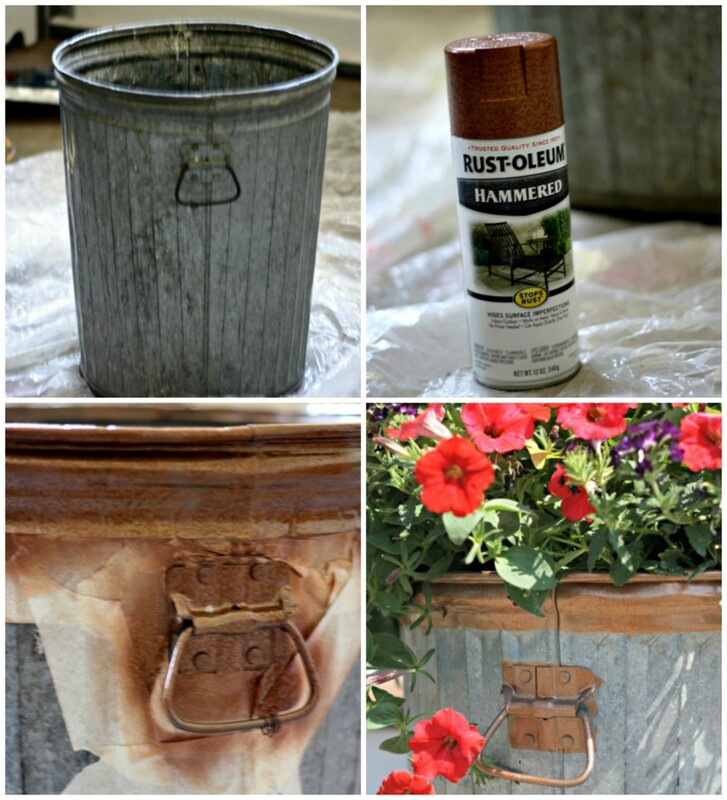 This may be my easiest and cheapest DIY yet…warning – you may find yourself scouring the side of the road for old garbage cans after reading this! Our neighbors were moving out last fall when I nabbed these beauties, yes I’m referring to dirty old trash cans as beauties. Charlie and Fran were the cutest old couple and had lived in the house next door for 35 years. My kids loved them and called them Opa and Oma (which if you are dutch, like me, you know means Grandpa and Grandma). All I did was add Rust-oleum hammered copper spray paint to the handles and the rim of the can to fancy them up a bit. Oh and the even easier part? Rather than filling the things full of dirt and having them weigh a zillion pounds, I flipped over a 5 gallon bucket in the bottom and just set a pre-planted hanging basket on top. Now, when summer is done they will be easy to stack up and store for the winter. I became a little obsessed with the hammered copper spray paint and gave some of my other planters a little copper love too. Brilliant! Love how these came out, very vintagey. Look at you gettin’ all junky! ;) Super cute planter, Kelly! I never would have thought to paint the handles! You’re such a smarty! HOw cute and creative is this!!!! LOVE the junky look with a little shiny metal sass! I hope you will share this at TUTORIALS TIPS AND TIDBITS… link goes live Wednesday at 8:00. Everyone will just love this! Fanstastic!! I love the look. I love your beast to beauty trashcans! Great idea, I love this!! They look very good! Thanks for letting us know about the copper paint. I like the look – I have several bits and pieces of metal equipment in the chicken coop and they’re just crying for a re-purposing. the copper paint is addicting, it just gives everything such a great pop! Kelly, that IS just the best repurposed project ever! How totally cute! I have a smaller metal trash can that my hubby used for the corn clinkers our corn stove dropped every night. It’s a bit weathered from the ashes and its spot outside – I’m totally going to do something fun with it now that we no longer use the corn stove! I think it looks great. I like the spray painted details too. Really cute. I have a close friend who did a similar look with an old metal janitor’s mop bucket, the ones with a ringer to ring out the mop. It’s on wheels so she can move it around easily too. Sounds a little silly but it is so cute each year with flowers spilling over the sides. Oh my goodness…I love this! 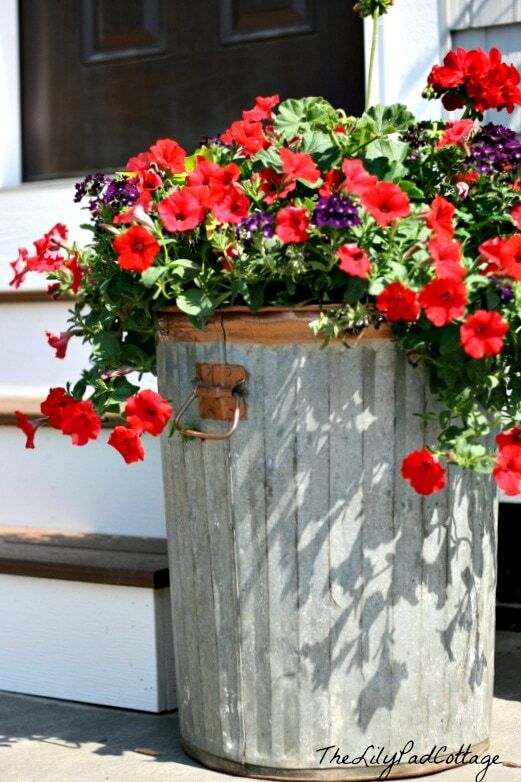 I have one of these sitting on the side of my house…I am so going to plant some flowers in it! Great job! This is awesome Kelly!! So smart! It looks fabulous. Pinned! Thanks Jenn, just linked it up at your party ha! Looks great. This is a first! Thanks Laura, my hubby thought I was pretty nuts when I dreamed up this one! It is outstanding. I love the copper accent too. I have an old trash on my deck being used as a table. Maybe I should plant it up. ooh that sounds cool Olive! Beautiful idea. I’m going to start looking for garbage cans. Thanks for sharing. What a cute idea! I have one in my garage that was my grandmother’s. What a beautiful way to display it!! Thanks for sharing. All linked up thanks, Marty! Super cute – who knew trash could be so pretty! 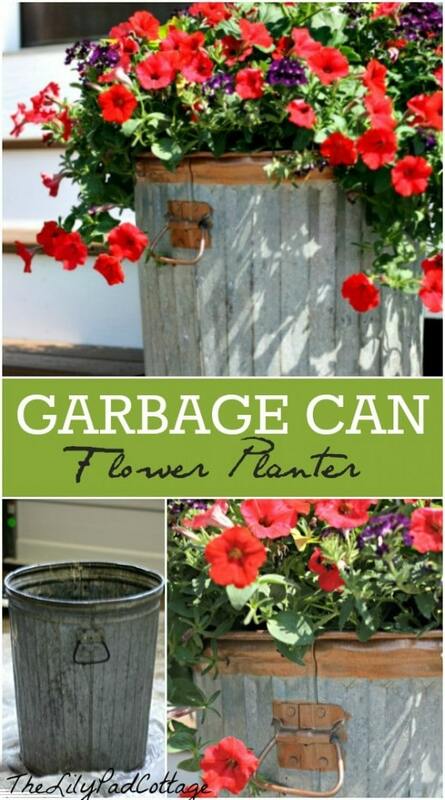 What a great way to re-purpose an old school trash can! Great post and site! I just found your site while looking around and am enjoying it… Are you open to additional blogs sharing your post? Let me know if you are interested. Bless you! Great idea, Kelly! 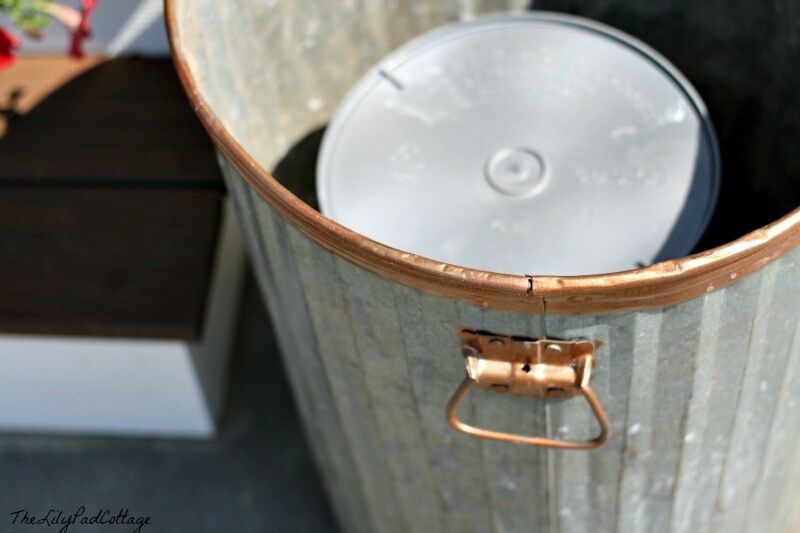 The copper adds so much … you’d never those were salvaged garbage cans. And your idea of just adding a pot in them is brilliant. Thanks for sharing,Kelly! Such an adorable DYI! Great idea! I love it… I have got to try some of that spray paint! Love, love, love this Kelly! You’re so clever! 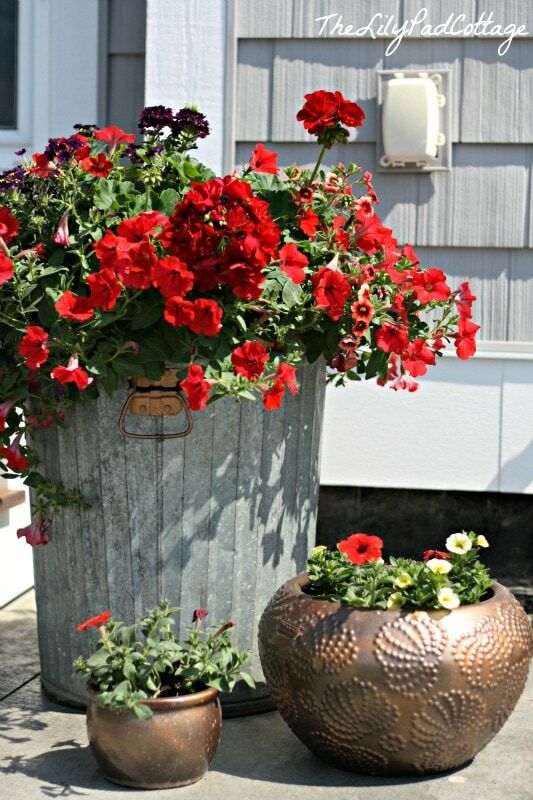 I also have flowers in a garbage can : ) but I love the hammered copper accents you added. Looks great !!! I have the lids to garbage cans, any great idea for those? They don’t make good frisbees, lol! So very cute! Now I have something to hunt for at garage sales this year! Love your website and your style!